Vegetable Kebabs. Regarding BBQ, Inc. The true tragedy of all outdoor cooking equipment is that the average grill will usually see steaks, chops, burgers, dogs, and the occasional chicken part. Despite how easy it is to grill up veggies, most people just don't think about it, simply because they are not sure how to do it. Well, I have the solution for you, vegetable side kebabs. They're quick, easy and you can make them in advance for when you need or want them. You can even make up a big batch and stick them in the freezer for future cookouts. First start out with the vegetables. You will want to pick vegetables that will cook in about the same amount of time. You can also choose items you like undercooked and add them to vegetables that cook faster. Basically, you want to put down your veggie kebab on the grill, cook it up, and pull off something great. (Don’t worry I have a couple of recipes down below to help get you started). 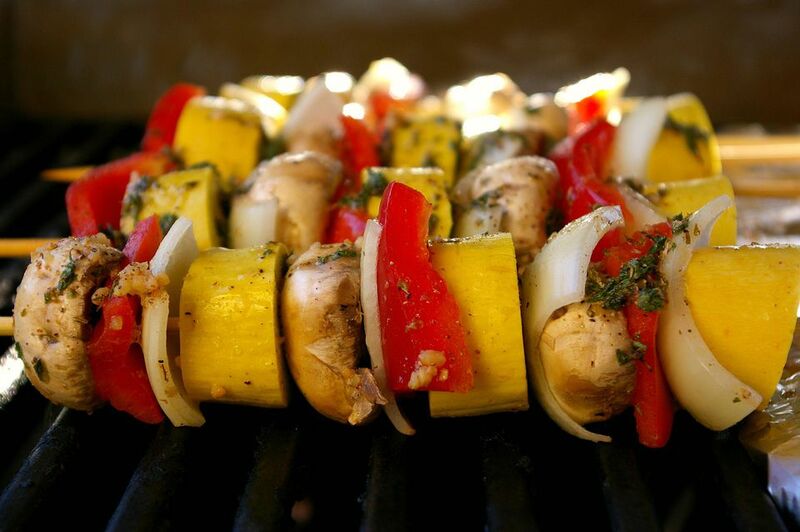 Some vegetables are easy to put onto a stick, especially if you are using metal skewers. Some vegetables can be hard, but that's no excuse. Take corn on the cob for instance. Cut the cobs into quarters or thirds. Push a metal skewer straight down the center and you've got it ready to go. If you prefer to use bamboo skewers (or want to use bamboo skewers for those kebabs you stick in the freezer), run a hole through with a metal skewer first then you can just slide it onto the bamboo stick. This works great for almost any vegetable that might be too hard for the fragile bamboo. Also, remember to soak your bamboo skewers in water before you put anything on them. Now you want to get some real flavor on those kebabs. I'm talking about a marinade. A good marinade not only makes your food taste better, but it makes it healthier. I’m not talking anything fancy here; try a store bought Italian dressing. Italian dressing is a great marinade because it contains oil, vinegar, herbs, and spices. It keeps the vegetables moist, limits burning and adds flavor. Brush your kebabs with your marinade at least 30 minutes before they hit the grill. This means you can do it the night before and be ready to fire up the grill the minute you get home from work. When grilling vegetable kebabs you will want to give them some good heat, but you don't want them getting a lot of direct heat. Keep your veggies to a cooler part of the grill or grill them indirectly with the other burners going on high. If you are using charcoal you will want an indirect fire or a single layer fire. This will give the veggies the heat they need to get cooked, but also prevent them from burning. Typically under this kind of heat, a normal veggie kebab will take about 10 to 15 minutes to cook. This depends on what you have on the stick, so adjust your cooking times and you'll be pulling off the kebabs a few minutes after you've taken the steaks into rest. The great thing about vegetable kebabs is that you can make them in advance. Try wrapping them up tightly in a resealable bag and put them in the freezer. If you are marinating, put the marinade on the kebabs and freeze them with the flavor on the vegetables. Use bamboo skewers for freezer kebabs so you won't tie up all your metal skewers in the freezer. Soak the bamboo sticks in water for 30 minutes first, though. When the kebabs are thawed the water will still be there. Take them out to thaw and the marinade will work from the second the frost starts to clear until a few minutes after they hit the heat. You can even put the whole resealable bag in warm water to thaw fast. This is a great thing to have on hand for when people drop by unexpectedly. It's going to be best if you don't freeze these kebabs for more than 6 months or the flavor will change. So now you don't have an excuse to grill up some healthy vegetables next time you've got those chops on the grill. Side dish kebabs can be practically anything you can stick on a skewer. Try corn on the cob pieces, artichoke quarters, squash (leave the skin on to give it shape), peppers, potatoes (choose new potatoes or small ones you can put on whole of in halves with the skin on), and anything else you find at the store. These vegetable side kebabs really are easy and since you can freeze them for later use, make them up in big batches.